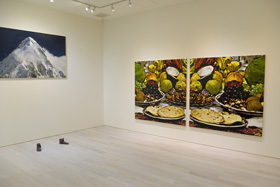 The works have been created by her spirit always seeking for new expression on canvas and particular motifs, such as mushroom described as “Still-Life”, potatoes named as “Body” and red on canvas within a frame painted in white. At a certain distance from the pieces, the mountain and sea look like photographs. However, a closer look shows her painting touch and oil mount on canvas. 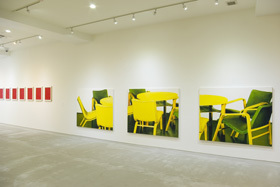 This exhibition shows her energy and evolution over the last 24 years through 13 works from “Coat on yellow canvas” in 1985 to “SKELETON octopus” in 2009. Copyright(C)1223GENDAIKAIGA - Contemporary Painting Collection - All Rights Reserved.